Located in the popular Cedar Lee entertainment district and open five days a week year-round (and every day in November and December), our shop sells and markets the creative output of more than 80 Ohio artists & makers on a consignment basis. 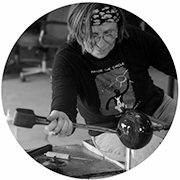 Most work is produced by the many talented artisans who live in greater Cleveland. We are continuously looking to showcase our region’s creative bounty, including: items for the home in ceramics, glass, wood and metal, jewelry, artist-made notecards, prints, photographs and works on paper, textiles and artist-made wearables. Have something else not on this list? Contact us. We’d love to hear from you. Please submit images of your work online via the button below for consideration. Interested in curating or being part of an exhibition? We accept proposals for guest curators and exhibitions year-round, from individuals as well as groups residing in Northeast Ohio. All proposals are reviewed bi-monthly by our exhibitions committee. Up to 5 images (JPEGs) of works that accurately represent the pieces or types of work that will be included in the proposed exhibition. When you are ready, please submit your proposal via the button below. Our Working Artist membership program provides both visibility and monetary support to the visual, performing and literary artists who are members of Heights Arts. VISUAL ARTIST members are eligible for inclusion in Heights Arts Spotlight gallery exhibitions, Artist of the Month program, Heights Arts Pet Project, and its other special commission programs, in addition to receiving all standard membership perks. MUSICIAN members have the opportunity to be selected for special gallery performances with paid honoraria in conjunction with our Close Encounters chamber music series and gallery concerts. LITERARY ARTIST members have the opportunity to participate in our new cross-pollinating program, Ekphrastacy, spearheaded by the City of Cleveland Heights Poet Laureate. This program invites creative writers to create poems and prose in response to works in each of our special exhibitions. Premier readings of the new works are presented by the poets at an evening gallery talk during the run of the exhibition. In its Artist of the Month program, Heights Arts purchases an original artwork from one of its working artist members each month. The artist and his/her work is then showcased in the gallery, in our newsletter and website, and through social media. All gallery visitors are invited to enter our free monthly drawing for a chance to win that month’s work of art. View our gallery of current and past featured Artists of the Month. 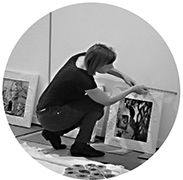 Visual artist-members also have the opportunity to be awarded special commissions by Heights Arts. At least once a year, Heights Arts invites a member artist to produce a limited edition artwork exclusively for Heights Arts. Editioned artworks are featured and available for purchase at Heights Arts gallery shop. Working artist members must submit portfolio materials here to be considered for Artist of the Month and commission opportunities. Become a Heights Arts Working Artist member. View our gallery of current commissioned works. We are devoting a new, online section of our website to local and regional calls for artists, including special commissions, public art, festivals and exhibitions. We welcome your input to keep this section active and timely! Please send any calls or notices to heightsarts@heightsarts.org.